Well hello there, friends! 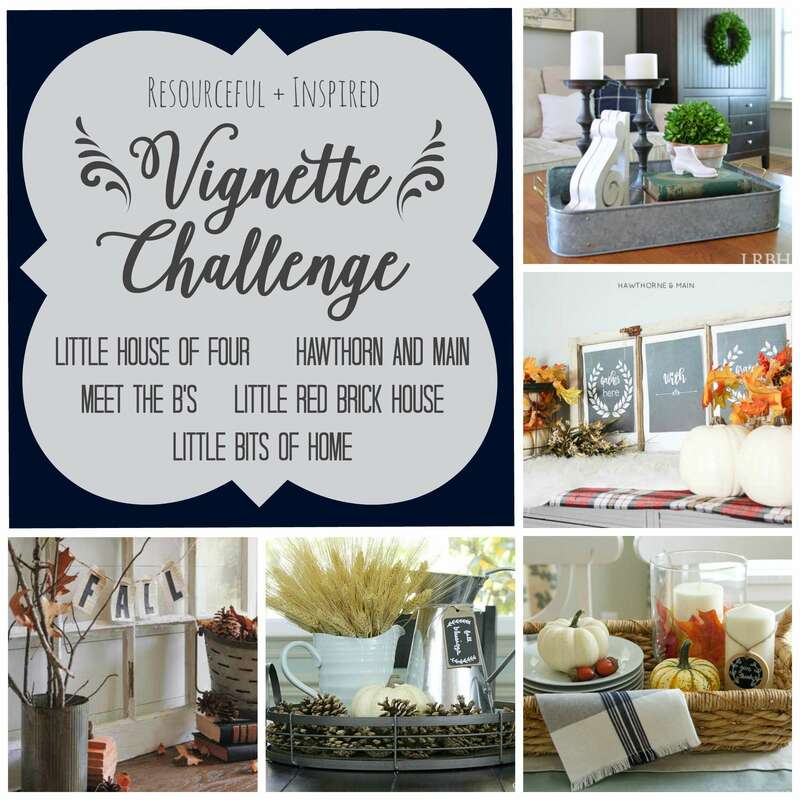 Today I’m taking a break from all things One Room Challenge related and teaming up with some blog friends to bring you a vignette challenge! 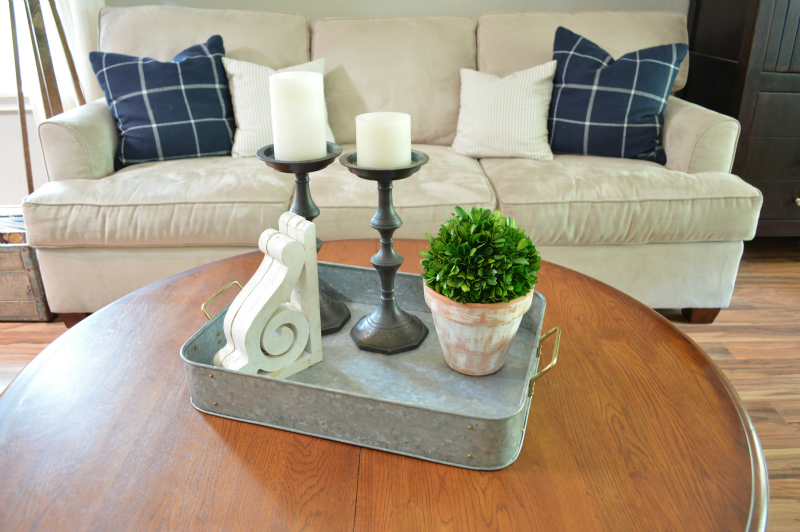 A group of us gals got together and thought it would be fun to each style a vignette somewhere in our homes using a predetermined set of items. We weren’t required to use everything on the list but we did have to use what we had on hand around the house. Here’s what we had to work with. 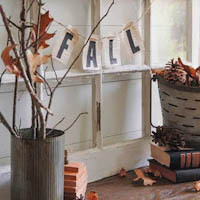 Natural items, such as acorns, leaves, wood, etc. I shopped around the house looking for my items and was pleasantly surprised at how much there was to choose from. Here is what I came up with for my items. I laid everything out and then set to work arranging them on the coffee table. 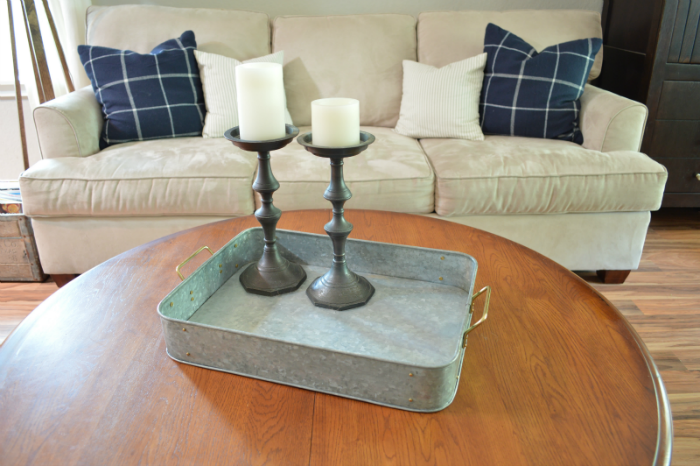 I decided to corral my items in a galvanized tray so that they didn’t appear to be floating in a sea of wooden tabletop. A really important element in a vignette is height. Using objects with different heights creates movement and helps your eye float effortlessly throughout the space. Since my candlesticks are the same height, I used two different sized candles to create the height variance I needed. Next, I grabbed a potted boxwood round to help bring in some nature and greenery. My mother-in-law gave me these perfectly chippy and worn corbels and I’ve been looking for a way to incorporate them into my decor. I thought about making a shelf but kept putting it off because that idea seemed so predictable. 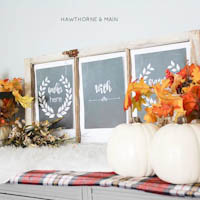 I’m so happy to use them in this vignette because they are so lovely but also because they hold some sentimental value. Then I grabbed some old books because….old books. They make everything look cooler. And in my opinion, no vignette is complete without them. And last but not least, I added this cute porcelain shoe and placed it on top of the books. It adds a bit of whimsy and is another element of sentimental value (my hubby snagged it for me while at the flea market one day). I even created a handy GIF to demonstrate the styling process! So, what do you think? What’s your favorite element of a vignette? 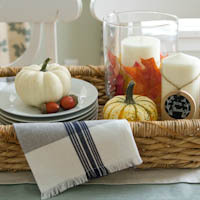 Be sure to check out the other arrangements that my pals came up with for their homes. You can check them each out by visiting the links below. Great vignette Sarah! I’m super jealous of the old books! Every time I’m styling something I wish I had some! I need to go on a book hunt!!!! Cute Sarah!! I love that tray! So simple and gorgeous! I love the pop of green! Thank you, Samantha! I had so much fun putting it together. I’m so glad you asked me to join you! 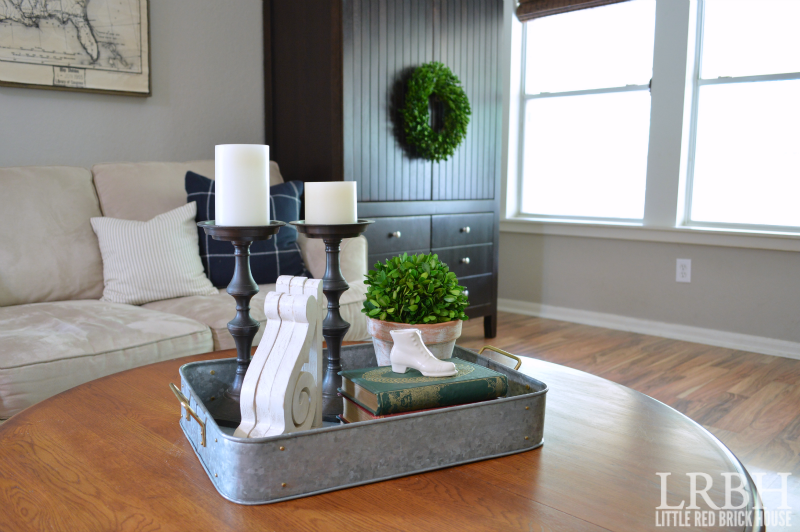 What a lovely vignette Sarah! I really love those corbels, I have been on the look out for some old vintage ones for a while. That shoe is awesome, I would have grabbed it too! Way to go hubs! This is so pretty, Sarah! The corbels are my favorite part because they’re unexpected AND they have sentimental value to you. The .gif is AWESOME!!!!! Thank you, Bre! It was my first time making one and I was surprised at how easy it was. Love it Sarah!! 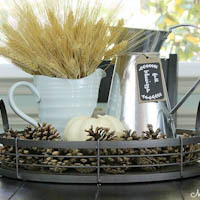 I adore anything galvanized and that tray is beautiful! Thank you so much, Stephanie! 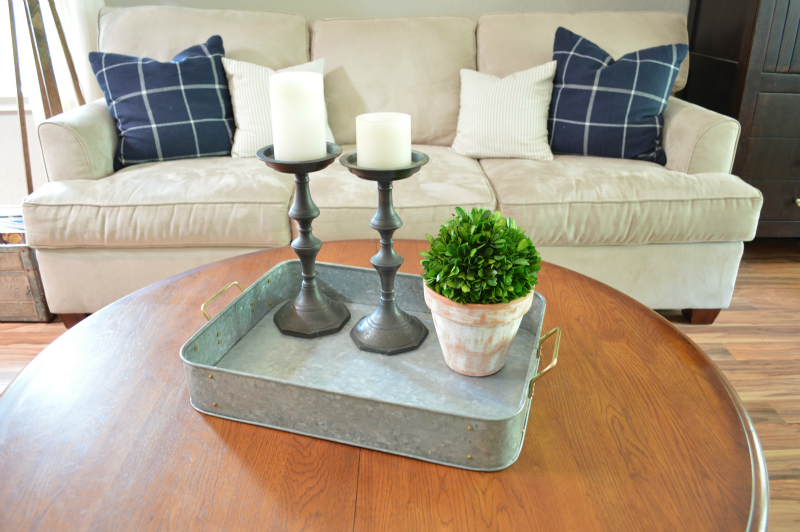 I am becoming more and more obsessed with all things galvanized, too, LOL! 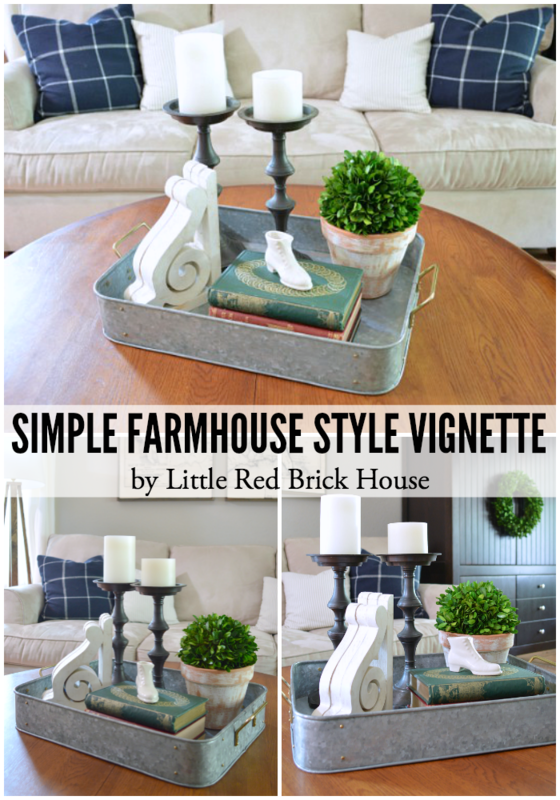 Beautiful vignette and you make it look so easy! I agree about the books! Thank you, Shelley! I definitely had to play around with it for a while to get it just right!